At 1.4 pounds (3 pounds traveling weight) and measuring 5.35 by 2.12 by 4.72 inches, BenQ’s compact Joybee GP1 is the one of the smallest LED projectors we’ve seen. It has most of the basic functions you need for making presentations, but its brightness rating of only 100 lumens makes it a better choice for very small groups than for large conference rooms. The Joybee GP1’s native resolution of 858 by 600. In image-quality tests, the Joybee GP1 earned a rating of Good for overall performance. The projector displayed legible lettering in most tests, but its low brightness made reading small, light-colored text on dark backgrounds more difficult. In graphics tests the Joybee GP1’s lack of brightness caused it to lose details in dark areas, and in motion tests it produced similar results. Compared with projectors that had more powerful light output, the GP1 generated highlights that weren’t as bright, and its details in shadows and dark areas weren’t as discernible. 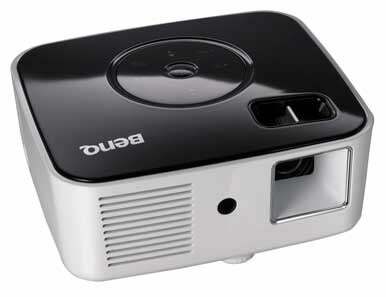 Like other LED projectors designed to be placed relatively close to the screen, the Joybee GP1 is simple to set up. Its fixed-focal-length lens (no optical zoom) is easy to focus, its single tilt-adjustment foot is adequate for aiming the projector at a raised screen or wall, and the unit has a tripod mount for more flexible positioning. A single multi-input cable provides connections for VGA and composite video with audio (you’ll need to provide your own DVI-to-VGA or Mini DisplayPort-to-VGA adapter), but its short length (3 feet) means you can’t place the Joybee GP1 far from a computer when using its VGA connection. For access to the on-screen display and image adjustments, the projector has a touch-sensitive control panel that’s fairly easy to use, and it includes a convenient Mode button for choosing one of the five preset picture options (Movie, Photo, and so on). Alternatively you can use the card-size remote to access the on-screen display, as well as to control the media player functions (to navigate a slide show or run a video, for instance). The compact remote is not quite as easy to use as a larger remote, however. One nice feature: The on-screen display has both a simple mode and an advanced mode, so you can display just the essential options (such as brightness and contrast) or show a longer list of adjustment controls. The projector is capable of playing slides, photos, and videos without being attached to a computer; using its built-in media player via an integrated USB reader slot, you can supply the content on a USB flash drive or another mobile storage device. In testing this feature, we found that the Joybee GP1 did a decent job in playing media from a USB flash drive. It was able to display PowerPoint slides only as still images, with no animation or special effects (such as moving text across the screen). You may have to convert video and music files to formats that the projector supports, and unfortunately, the provided file conversion software is for Windows only. Supported file formats include BMP, GIF, JPEG, and TIFF for graphic; MPEG-1 and Motion JPEG for video; and MP2 for audio. The GP1 also has a modest-sounding 2.0-watt mono speaker, but you’ll probably want a more-powerful audio source when viewing DVDs and other videos. The Joybee GP1 is a decent choice for small-group presentations, as long as you can control the lighting conditions and use the device in a dimly lit or darkened room. For budget-minded business travelers with limited needs, the Joybee GP1 is good enough to serve as a slide-show display unit for one-on-one presentations, small sales meetings, and other modest gatherings.